As I've spoken about previously on my blog, I chose to give birth to my son almost 2 years ago by elective c-section...you can read my detailed birth story here if you wish. One of the reasons that I had put off having children until I was 30 was because I have always had a huge fear of death - and this means that in any situation where I feel out of control of what's happening to my body, particularly in situations relating to my health or in situations where I feel pain - I suffer with anxiety attacks, because in my mind pain = danger which may lead to death. I am very aware that statistically you are actually at more risk when undergoing surgery than when giving birth naturally, but statistics mean absolutely nothing to my anxious mind. So when I eventually became pregnant and was faced with the very daunting prospect of having to somehow give birth to baby, I decided that I needed to feel as in control of the situation as possible in order to survive the experience without an anxiety-related breakdown. I did not trust myself to be able to stay calm during labour, I did not trust myself to be able to deal with the unknown elements (when it would happen, how long it would take, if there'd need to be medical interventions and so on) - the very thought of these things induced panic attacks in me so I had no doubt that I would suffer huge panic attacks during the event itself. Instead I felt that an elective c-section was the way forward - I felt that the certainty of a date enabled me to feel more in control and focused, I felt that I preferred to trust a skilled and competent surgeon who had done this hundreds of times before to deliver my baby safely than to trust myself. I knew it was the right decision both for me and for my child - more than anything I did not want him to be born to a hysterical panic-stricken mother. I have never ever regretted my decision to have an elective c-section - I was scared in the run up to it of course, but I feel that I had the most positive and calm birth experience I could ever have had. I am often asked if I feel I "missed out" on experiencing labour or natural birth - the short answer is NO. Why would I feel I had missed out on something that terrifies me to the core to think about? Think about your biggest fear and then consider whether you would feel that you had "Missed out" if you were never exposed to it. And so when I became pregnant again, I knew that I wanted a c-section again. There is a common misconception here in the UK that you MUST have a clinical reason to request an elective c-section. Women in the EU have a legal right to to make choices about the circumstances in which they give birth - this means that any limitation on that right must be justified. In short - any Doctor or Midwife who refuses your request for a c-section must be able to give proportionate reasons for their decision based on the individual circumstances of the woman and their reasons can be tested in court before a judge. It is highly unlikely that any such case will ever reach court as the cost of litigation far outweighs the cost of performing the elective surgery, but it is worth knowing your rights! The NICE guideline on elective c-sections without a clinical indication states that women ought to be offered a c-section after discussion and an offer of mental health support. When I first informed my consultant that I wanted to have a c-section, I was met with a very icy reception. He of course told me all of the risks, told me various horror stories to try to scare me out of it - I was prepared for this as I had done my research online and knew to expect this sort of reaction - I stood my ground, and was then presented with some leaflets and documents to sign stating that I had been warned of all risks. 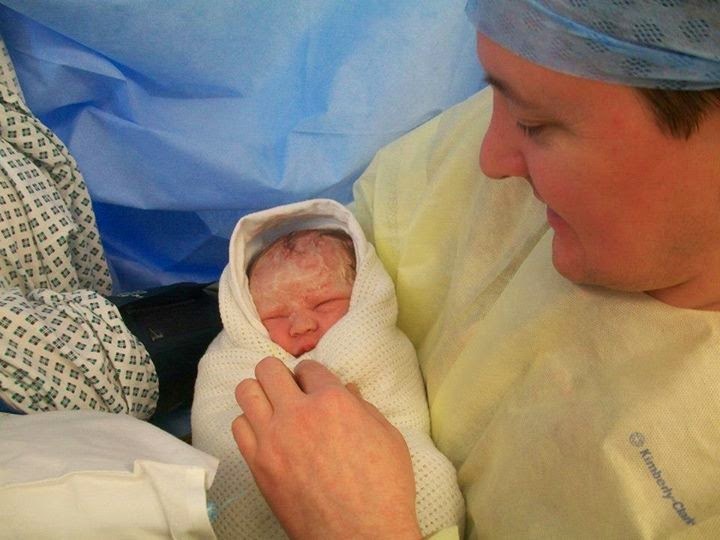 I was then referred to a specialist midwife to discuss my birth fears and, I suppose, to have him try to talk me out of my decision - I went along and spoke with him, but informed him that I still wished to have the c-section. It was then agreed and my date was given. These sorts of reactions always make me laugh - she hadn't even asked WHY I had elected to have a c-section, people always simply assume you're "too posh to push" or merely wanting the convenience of a set date - she informed me that in Devon I would have been referred to a mental health specialist who would talk me out of it. I told her that WAS what had happened and he had failed to pursuade me out of my choice - she then had to concede that actually yes, in that case I WOULD have been given a c-section in Devon. My planned c-section experience was relaxed from the start. I was given my date a few weeks beforehand, so I had time to start preparing myself mentally - I used some hypnobirthing cds specific to c-sections to help me to relax. A few days before my operation, I went in to have my pre-op appointment - I was told what time to arrive at the ward on the day, I was told I would be one of 4 women having a c-section that morning, and I was given a tablet to take the evening before the operation and asked to have nothing to eat or drink but water from 10pm the night before. On the big day, I was to arrive at the ward for 8.30 am. When I arrived, myself and Jon were led to the ward and I was shown to my bed. We were told that there two people before us, and that the surgeon and anesthetist would come around soon to discuss things. The anesthetist came a while later and went over some of the possible risks with me - they informed me that sometimes spinal blocks do not take effect and in this case would I prefer to be put to sleep or would I prefer to discontinue the operation - I stated that I would rather discontinue. The surgeon then came around - he introduced himself, informed me that he would be closing with dis solvable stitches and asked if I had questions or concerns. He was very calming and made me feel very at ease. At around 11 am, a nurse came to get me and gave me a surgical gown to change into. I changed and was then led with Jon to the theatre...before we went in a nurse helped me to get into my surgical compression stockings, and they then informed me that Jon would need to get into his scrubs while I went in to have the spinal block (This is not the case in all hospitals, many allow your birth partner to accompany you for the spinal block). I was taken in to the theatre and sat on the operating table, I was asked to lean over a pillow while they put the spinal block in place - I was then helped to lay down and wait for it to take effect. Every now and then they would spray me with a cold substance to check if I had become numb - this was where I started to panic as I hated the feeling of my body becoming numb, but the anesthetist noticed and stayed with me calming me down. They then put up the sheet and people started gathering around to start the procedure - Jon then came in, and a few seconds later they told me that they had started. I was surprised that I couldn't feel anything apart from a bit of pulling. A catheter was put in as I would be unable to stand up for a while afterwards - I had been concerned about this but I couldn't feel a thing! Around 10 minutes later, the baby was out - he was cleaned up and brought around to us, and handed to Jon to hold. After about 15 minutes I was all closed up, and was taken in to recovery for about half an hour - every few minutes a nurse would check me down below to check for clots and would check my wound. I often hear stories of peoples horrible, long recoveries from c-section deliveries but 9 times out of 10, when I enquire further - it turns out that the people who have these bad experiences actually had emergency c-sections rather than planned ones. 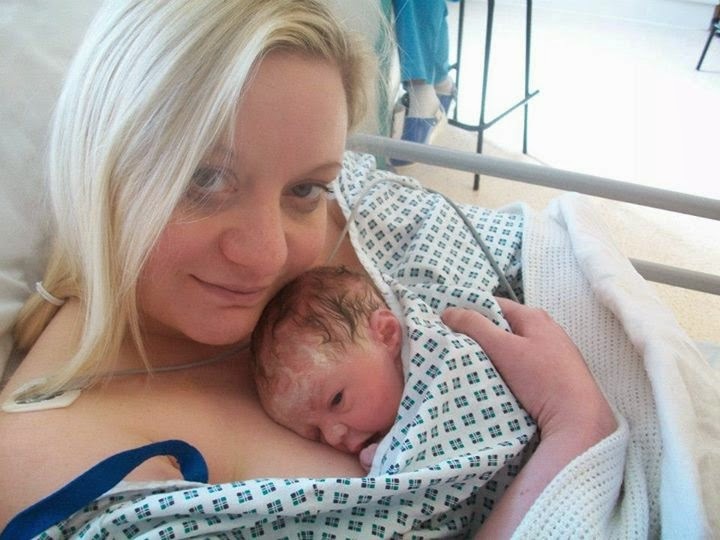 I'm sure some people do have bad experiences with planned c-sections just like some people have bad experiences with natural births - but I do think there is a HUGE difference in the experience and the recovery period between an emergency c-section and a planned one. That evening, I was feeling tender but nothing like the pain I had imagined. My catheter was removed and I was able to walk around. The next morning I was walking around as normal, and feeling pretty good - although I did develop a cough which was irritating as it hurt my wound a bit to cough! I was allowed home the next morning and was given some anti-clot injections to do myself at home for the next week or so, and some pain relief to take. Although I never felt in much pain, I continued to take the pain relief to be on the safe side. My only experience of discomfort was about 10 days later when I was hit with bad trapped wind, which can be a common side effect. Other than that my recovery was very quick and smooth, and I was out shopping as normal within 3 days of having the c-section. My wound healed well, and I had no complications. I am of course nervous about how things will go this time, and after such a positive experience last time I worry if I can be so lucky again - I guess time will tell! *Large knickers - you want ones that will sit ABOVE your wound, not on it! *A pillow - I found it useful to hold a pillow tightly to my wound whenever I needed to cough or laugh, the pressure made it easier. Good for you for sticking to your guns. I suffered with anxiety in the past so can imagine how you would feel awaiting natural labour and being in the throws of it. It's such a shame that medical professions seem to frown upon it and make you jump through hoops to get it. I hope it goes just as well for you this time round - at least you have the advantage of knowing what to expect, which should hopefully help your anxiety. 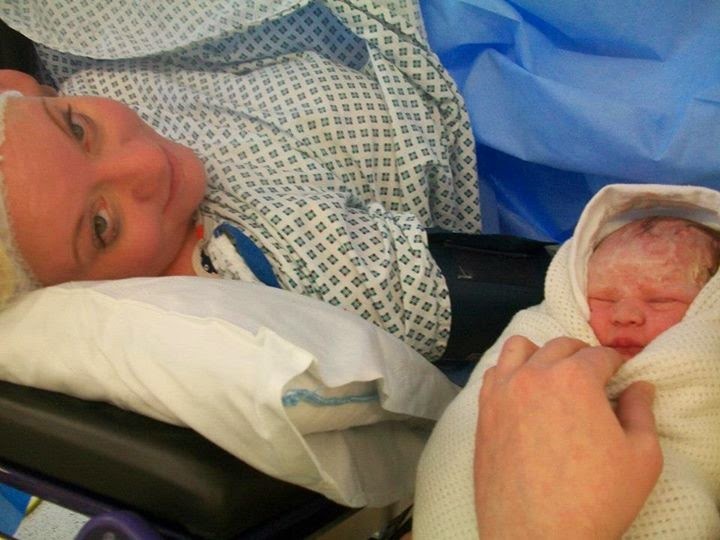 I had an emergency c-section but without going through labour beforehand, and had a really good experience and recovery. I imagine if I had gone through an exhausting and painful labour, as well as ineffective pushing, and then having an emergency c-section, it might have taken more time to recover. I had an emergency c-section, but I found that I recovered faster than many friends who had 'normal' deliveries. My c-section wasn't a crash one, but it certainly wasn't as chilled out as yours sadly, largely because I'd been in labour for over 24 hours. I'd certainly go for an elective in the unlikely event of another baby. Well done for sticking to your guns. I had an emergency C-section due to Blake getting stuck but if I ever do have any more children in the future than I probably would opt for a c-section. I didn't know you opted for a c section and that these where your reasons, I found it very interesting to read all about it. I think it's great that you decided what was right for you and your baby. You did the right thing and I am glad you don't regret anything and that it made your birth experience calm.